What happens in burns? 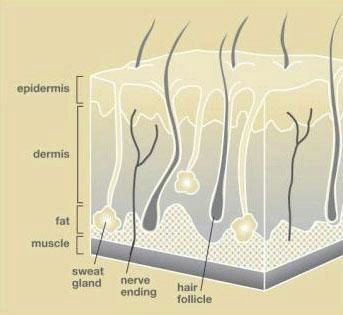 When the skin comes in contact with something hot, it may be damaged, with death of cells in the skin. The depth of the injury depends on the intensity of the heat and the length of time that it is applied. If sufficiently severe, the full thickness of the skin can be destroyed, as well as tissues under it. Burns can also result from contact with certain chemicals. What are the degrees of burn injury? 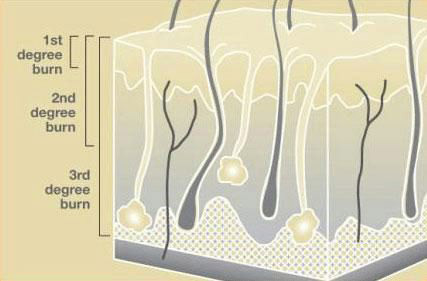 Burns are classified by the depth of injury, which helps determine the appropriate treatment (see Figure 12). leave scarring. A burn that goes around the full circumference of the limb can sometimes constrict it like a tourniquet. In such cases, the constriction may need to be released, a procedure known as escharotomy. What about therapy and rehabilitation? The need for therapy depends on the depth of the burn wound and any other factors that may lead to stiffness in the hand. Superficial burns generally will not need any formal hand therapy. Deeper burns or those that occur in conjunction with other injuries may require extensive therapy and ehabilitation. Your hand surgeon will coordinate therapy with a therapist if he or she feels that you would benefit from rehabilitation. Will additional surgery be necessary? Many patients with burn injuries will require more than one operation. Many burned hands will develop contractures months or years after the original injury. Longterm follow up with your hand surgeon should be planned to evaluate for the possibility that further surgery may improve your hand function.